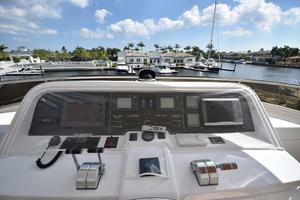 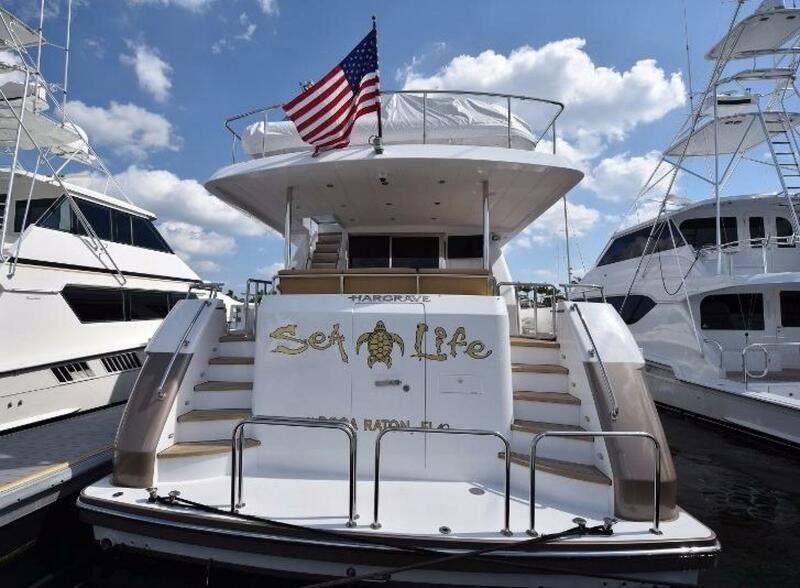 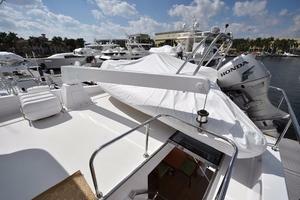 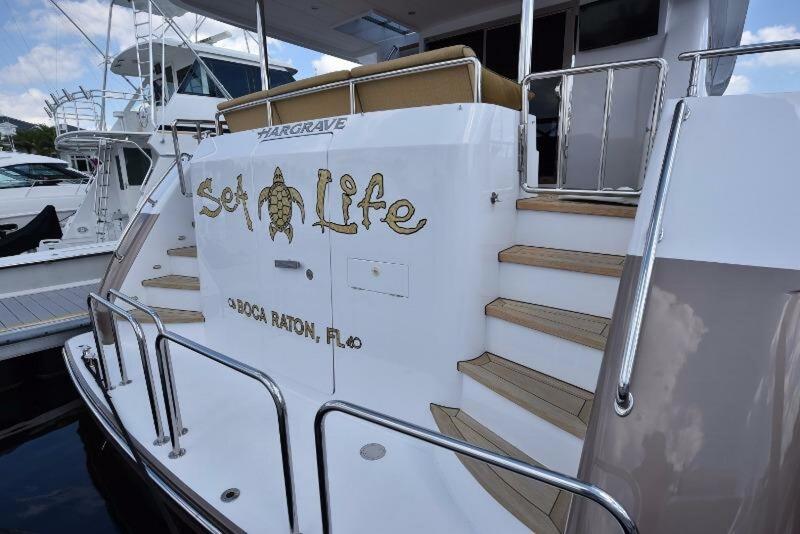 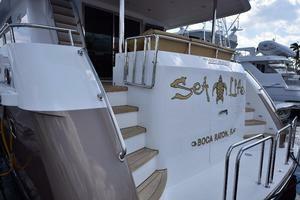 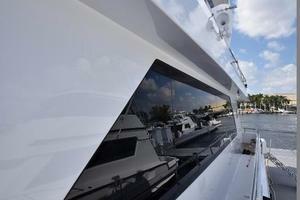 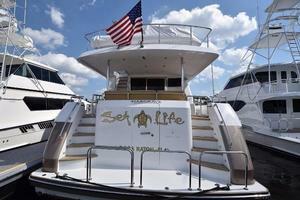 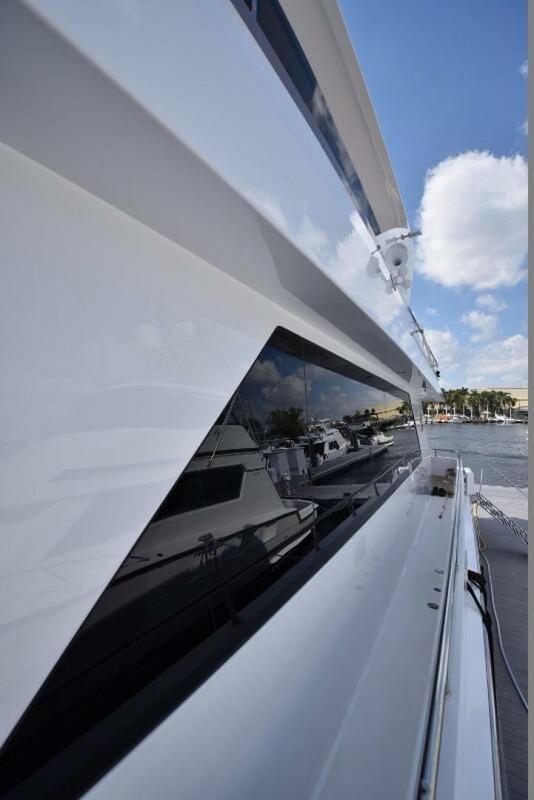 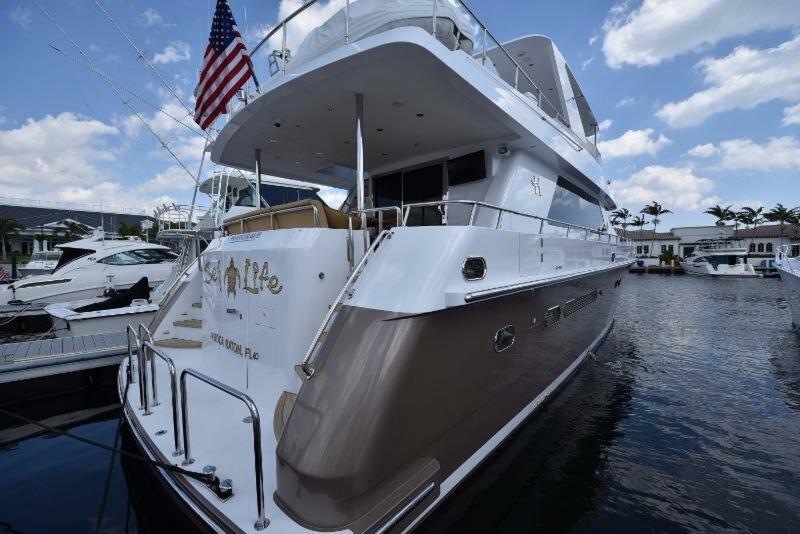 Upon entering SEA LIFE , one is struck by the clear sight lines fore to aft, a feature that is the hallmark of this yacht. 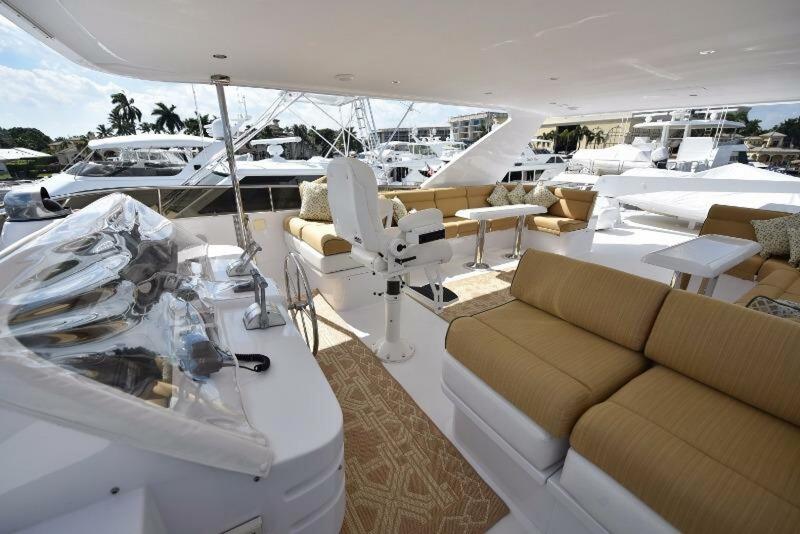 The full-beam main salon is complete with satellite TV, a large screen plasma television, state-of-the-art entertainment electronics, and satin finish cherry cabinetry. 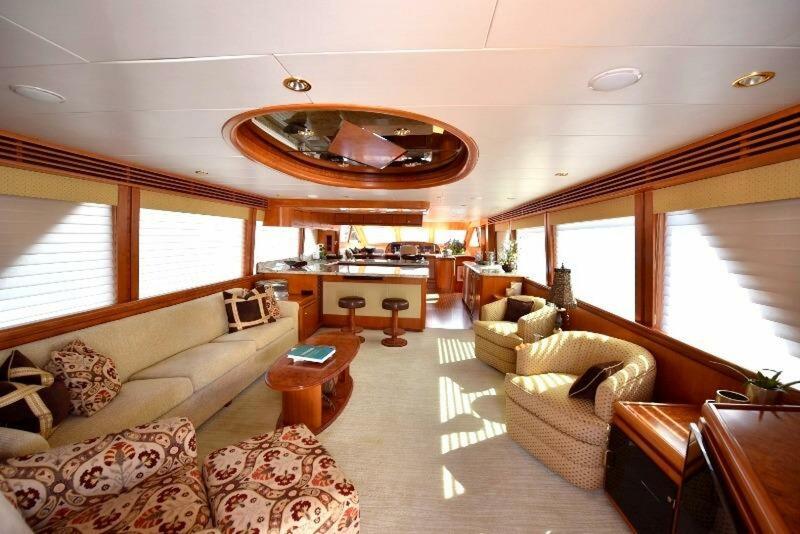 Silk roman shades and soothing tones complement the stunning view outside. 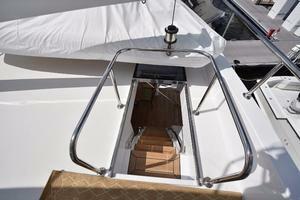 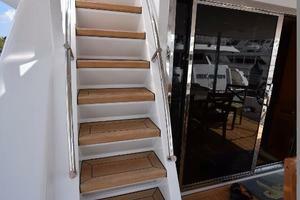 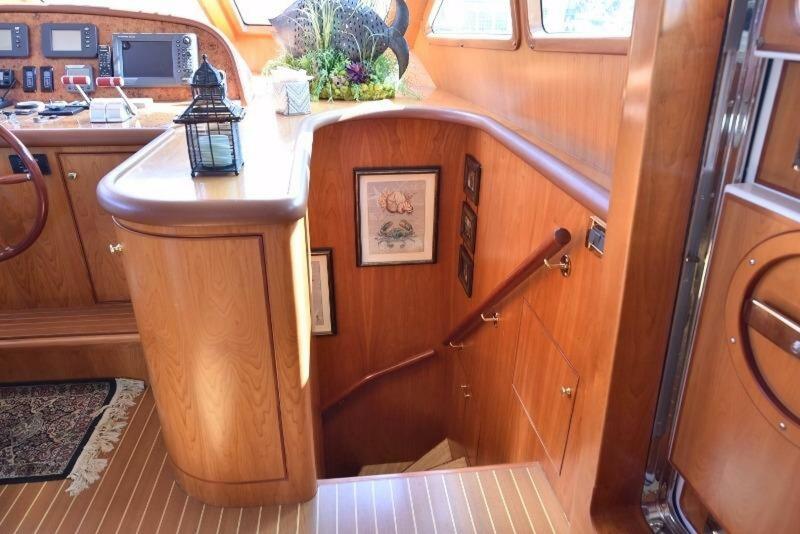 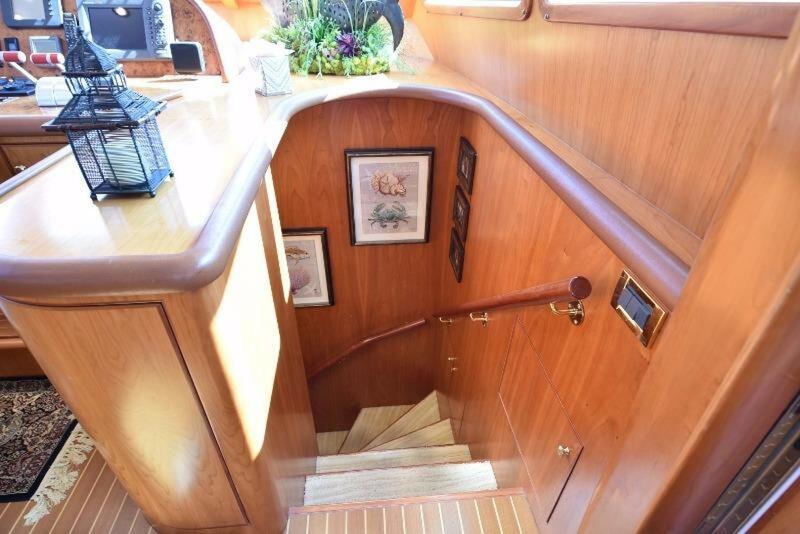 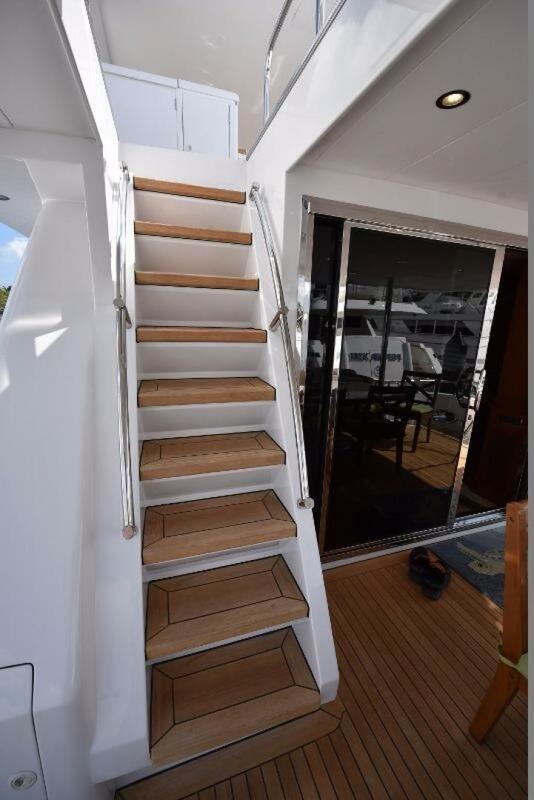 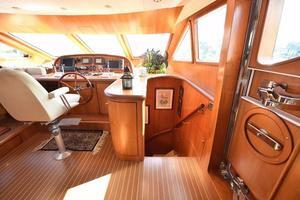 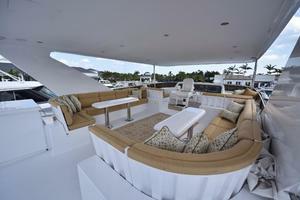 Wide stairs curve down from the pilothouse to the yacht's accommodations deck. 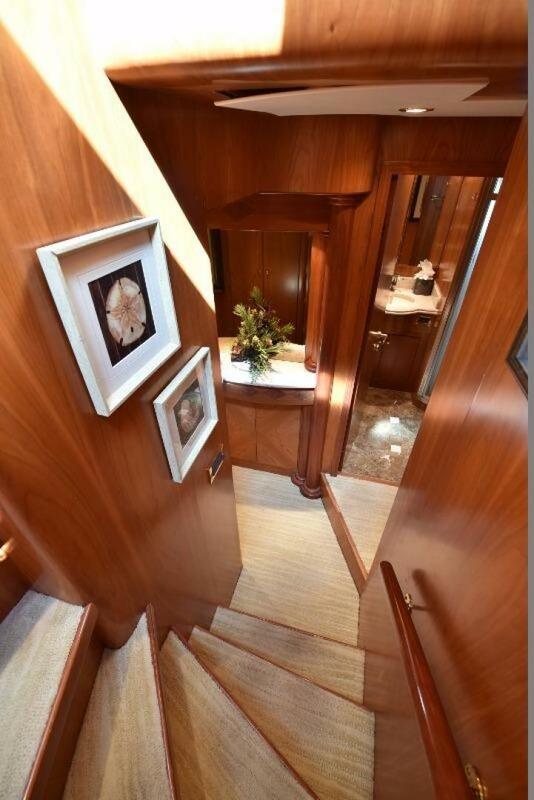 Access to all three staterooms is via a lower foyer. 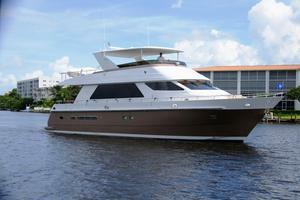 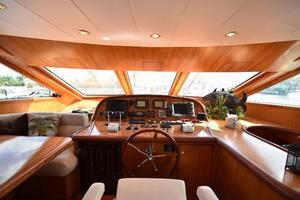 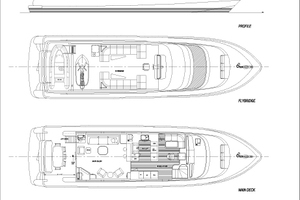 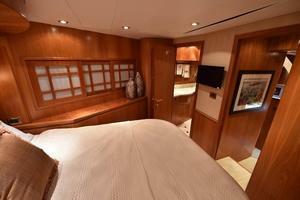 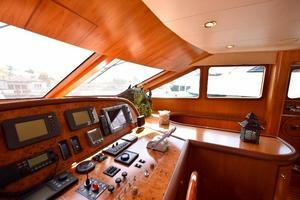 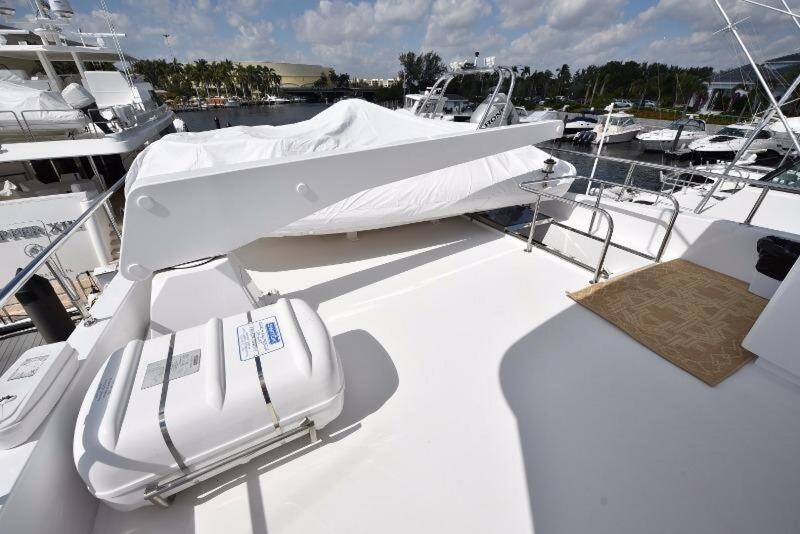 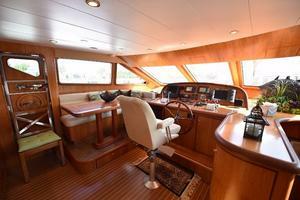 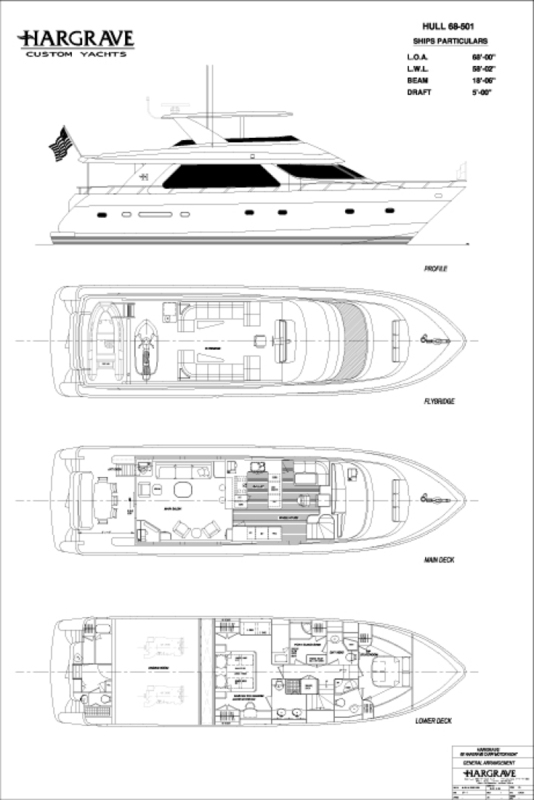 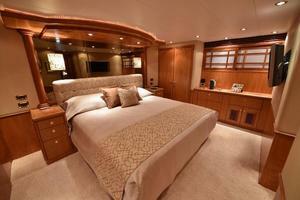 The full-beam, king-size master stateroom is located just forward of the engine room. 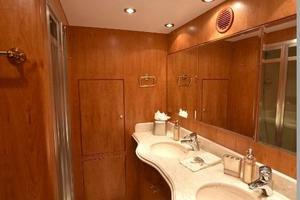 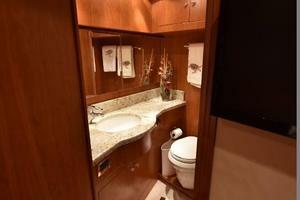 It features a vanity and full-length closets on either side of the stateroom which provide ample stowage. 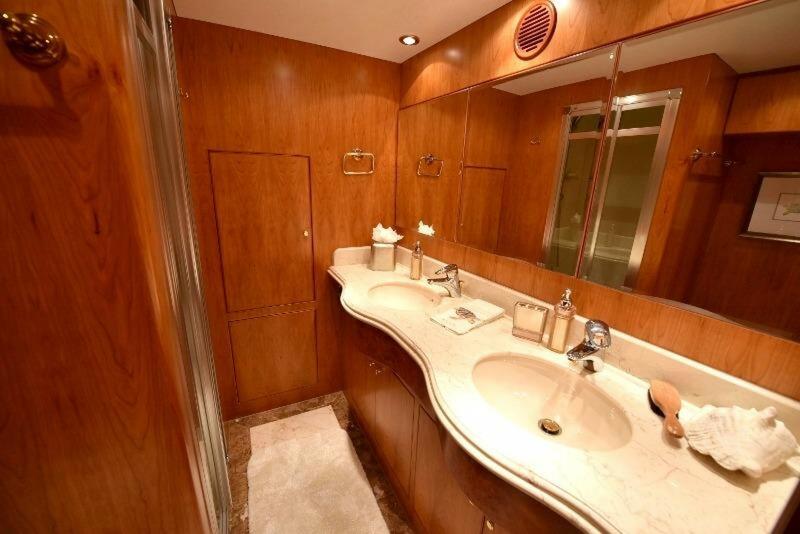 The master bath is ensuite and is finished in cherry wood with coordinating granite flooring. 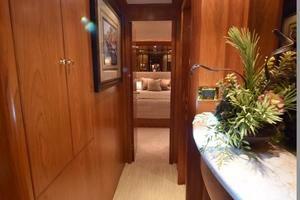 In addition, all guest suites feature a full complement of entertainment electronics including flat screen televisions. 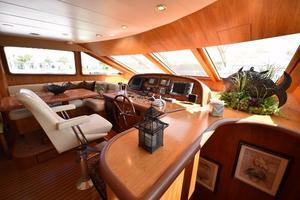 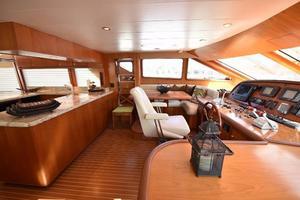 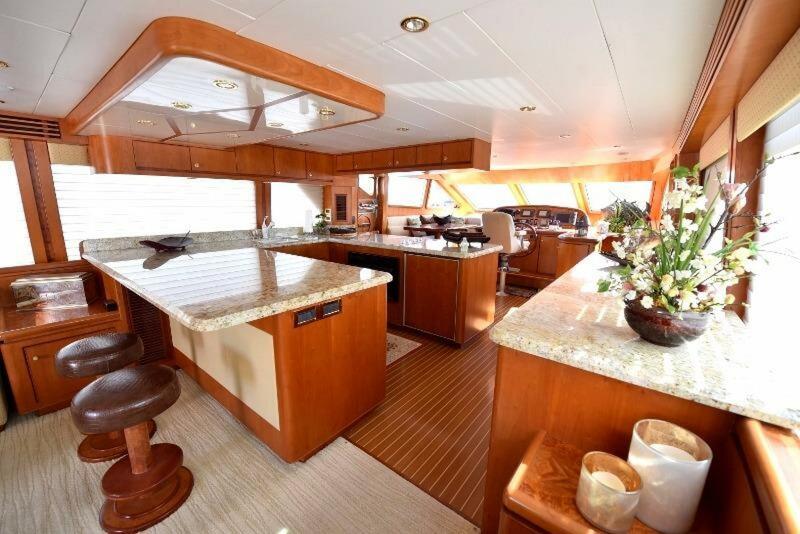 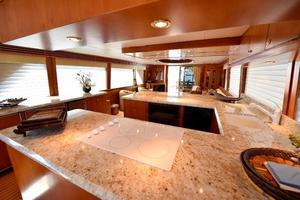 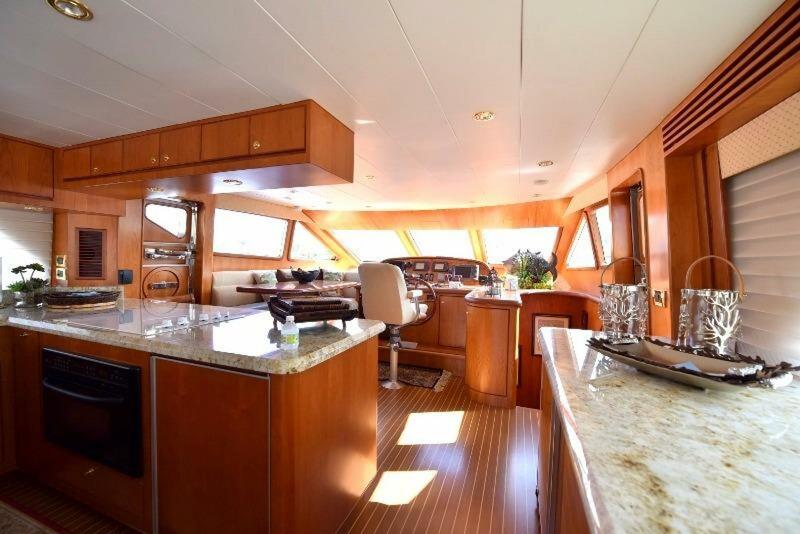 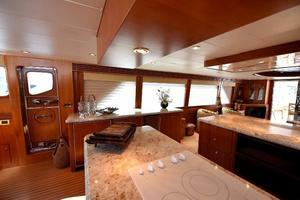 A pair of bar stools found forward in the spacious salon are situated facing the granite-clad counters of the galley. 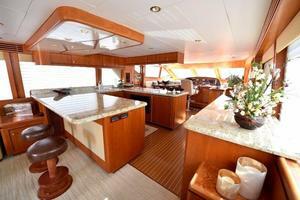 Here, guests can watch as the chef prepares culinary delights. The teak and holly floor lends itself nicely to the cherry wood cabinetry and granite. 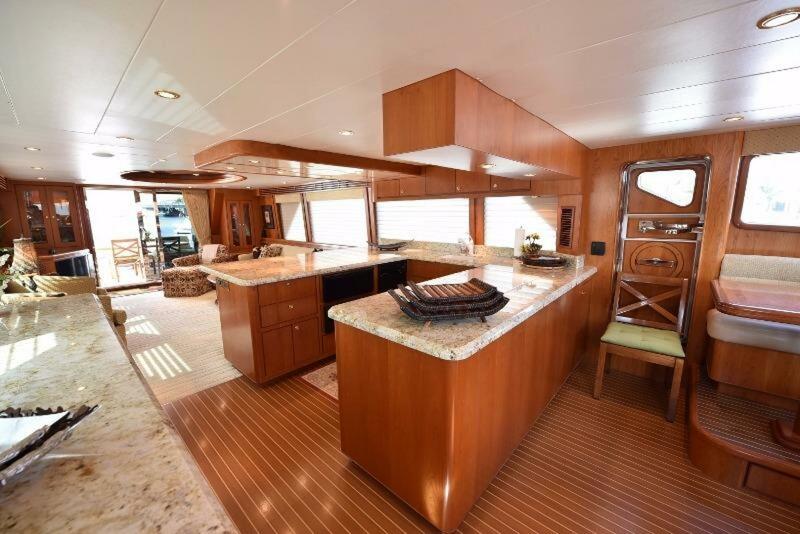 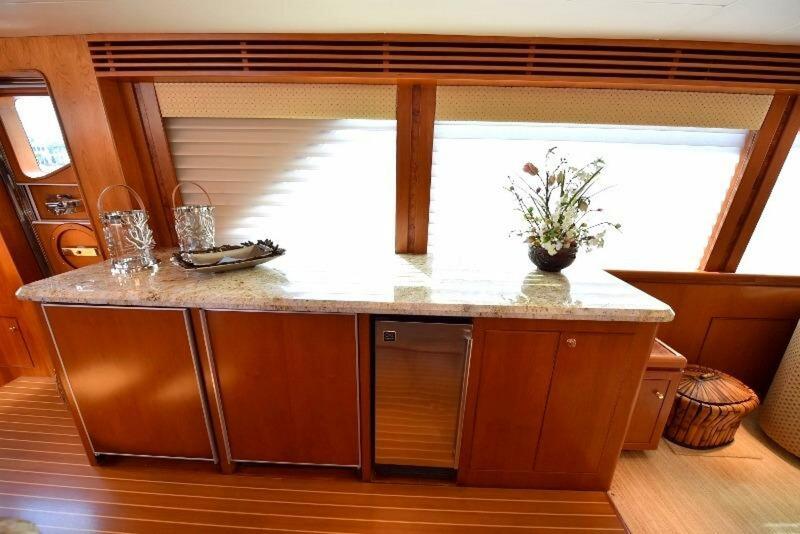 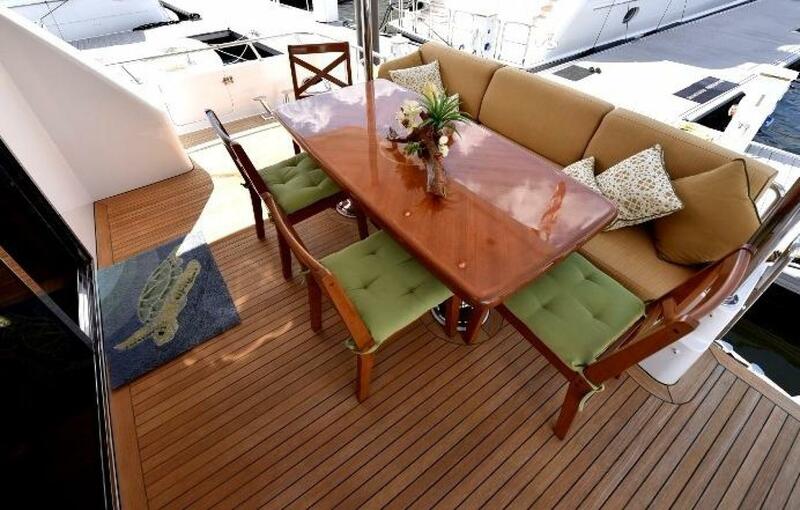 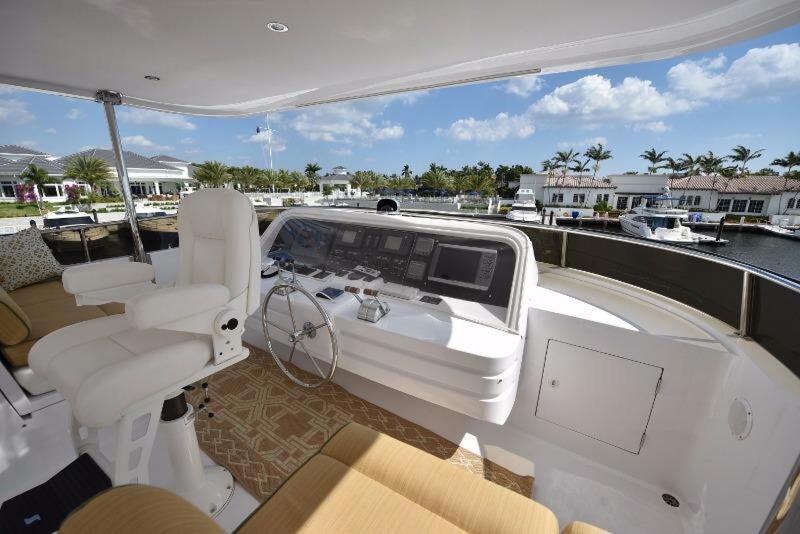 The unique u-shape of this galley gives you plenty of storage and ample counter space. A substantial stainless steel Franke sink faces picture windows and allows natural light to filter in. 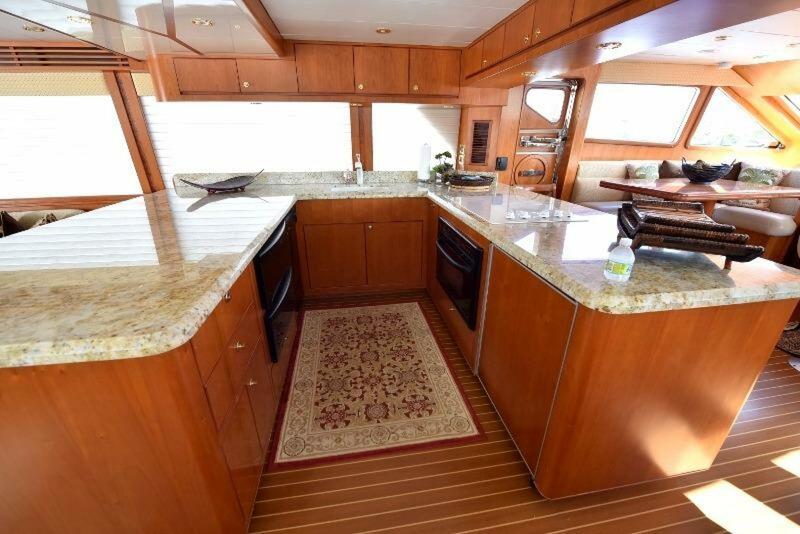 This space is nicely equipped with name brand appliances such as under counter stainless steel Sub-zero refrigerators, freezer and icemaker, a Dacor black cook top with GE microwave, two Dacor black warming ovens, a GE Profile black Dishwasher, and GE black garbage disposal. 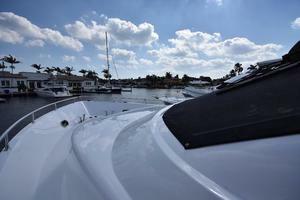 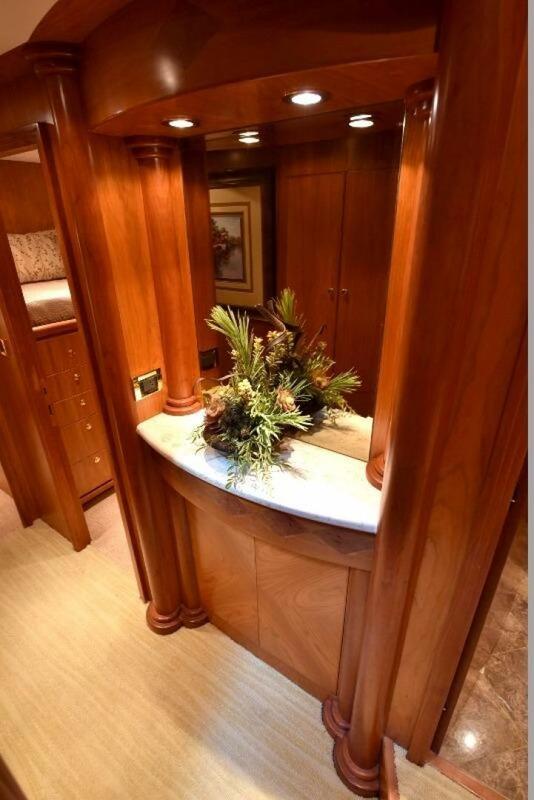 Overhead cabinets provide sweeping views both forward and aft. 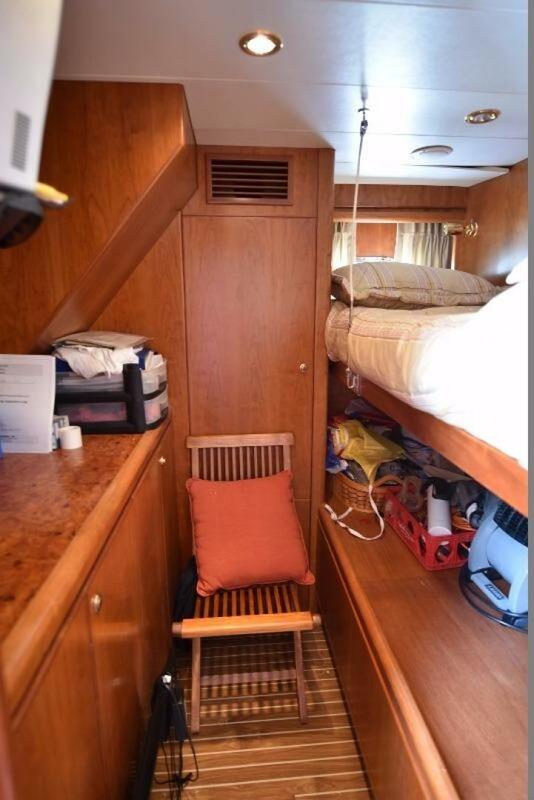 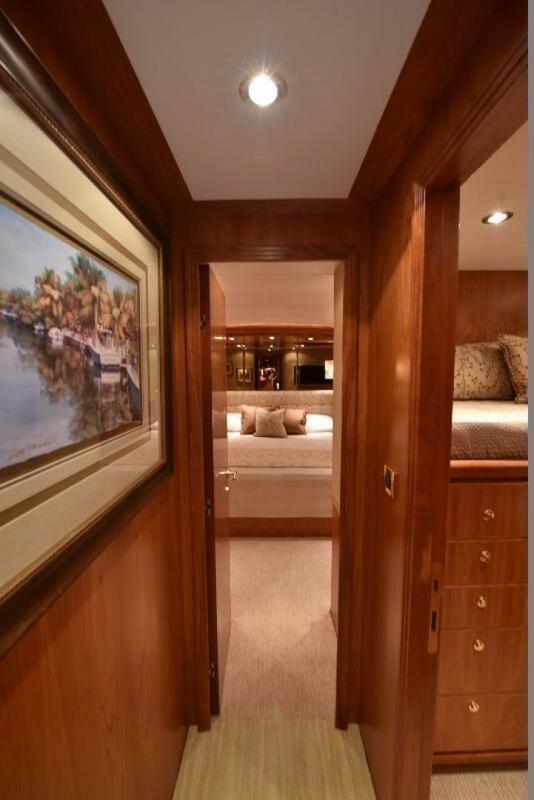 Down a few steps and forward of the aft bulkhead is the master stateroom. 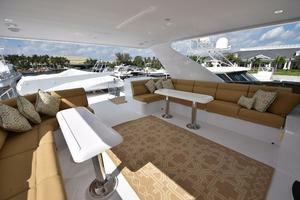 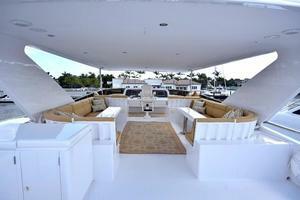 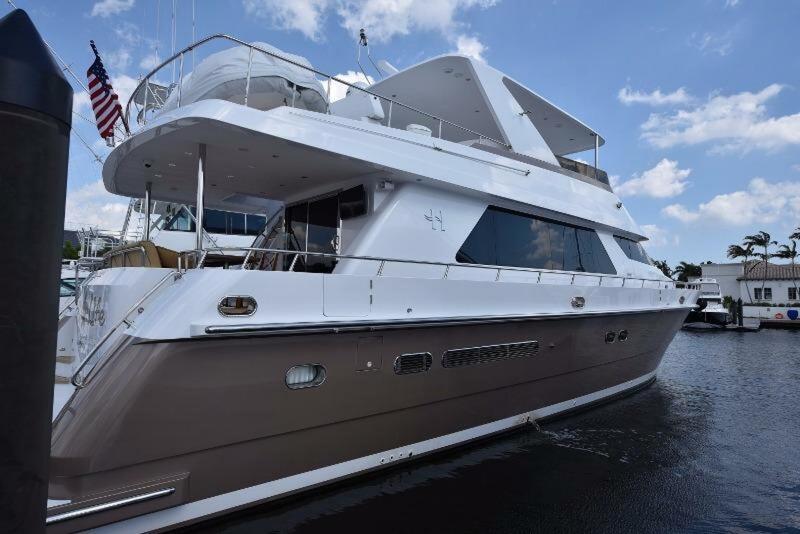 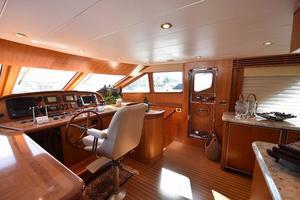 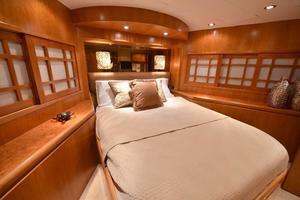 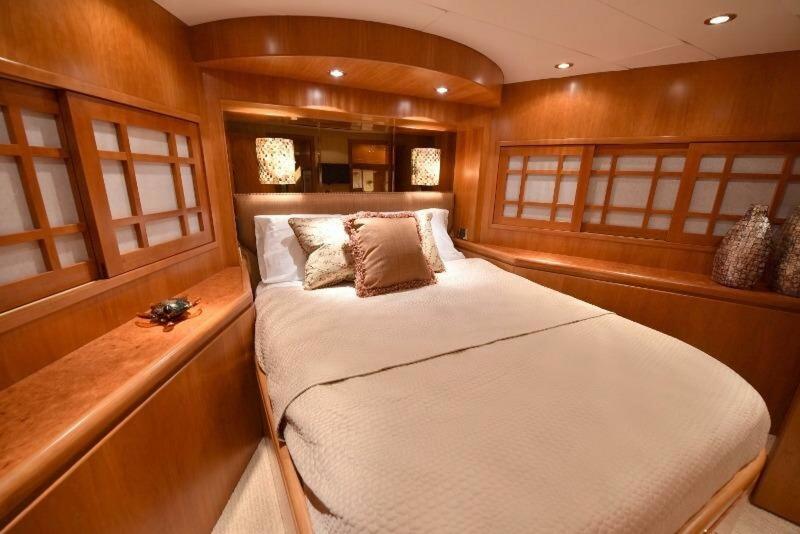 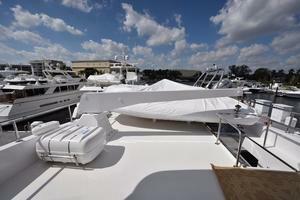 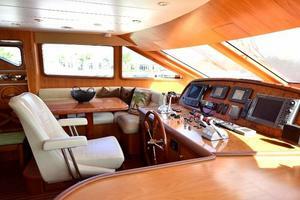 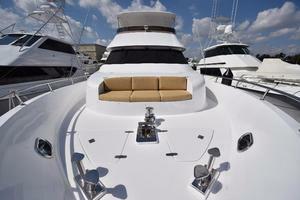 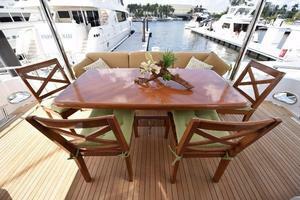 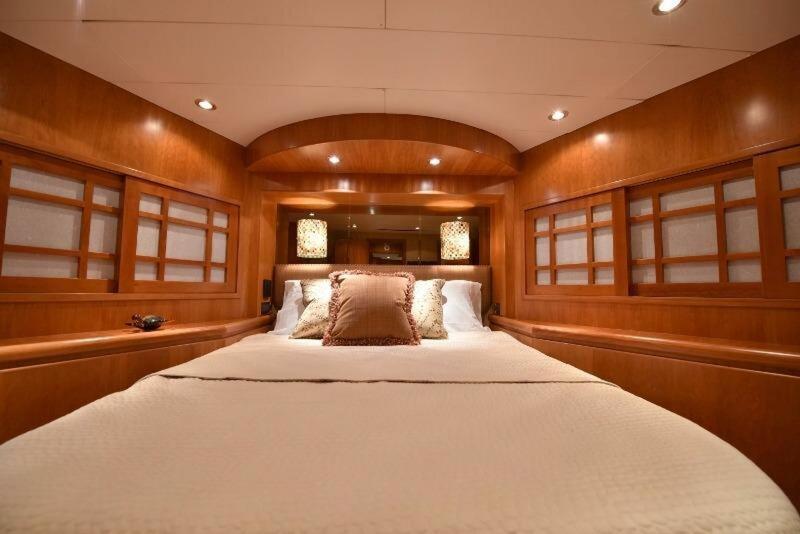 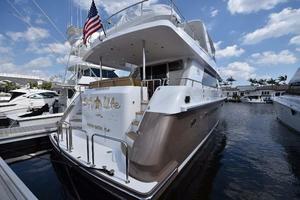 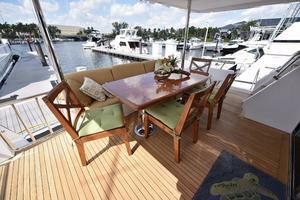 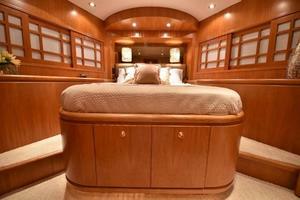 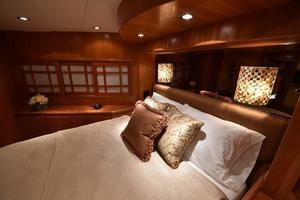 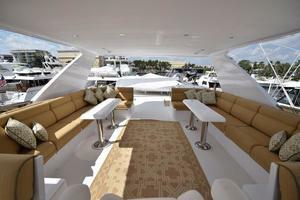 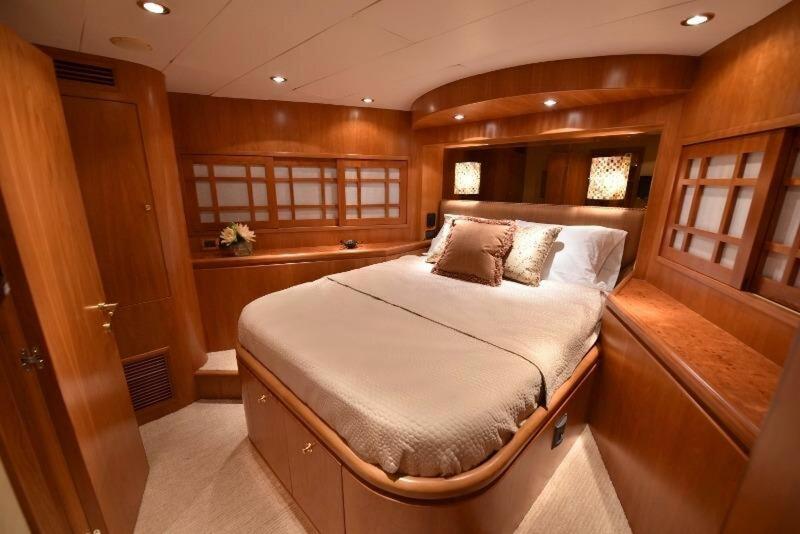 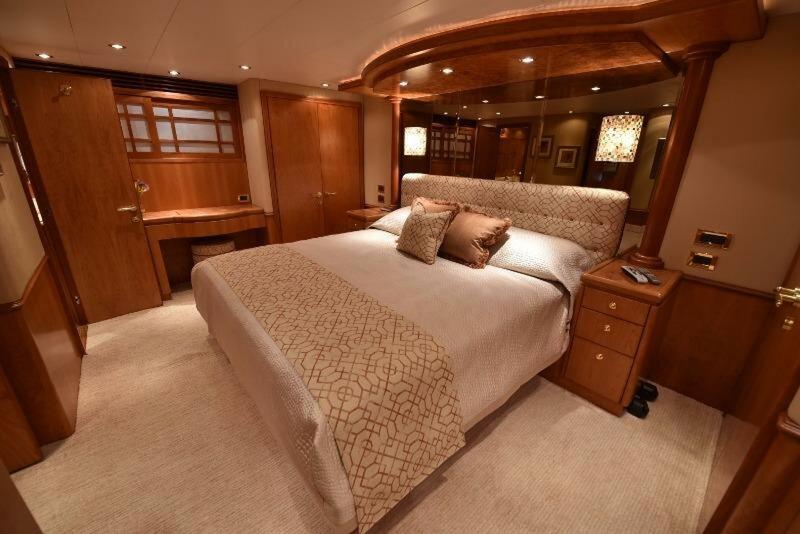 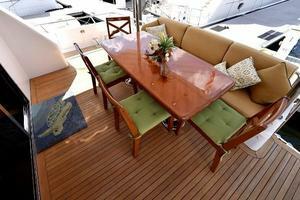 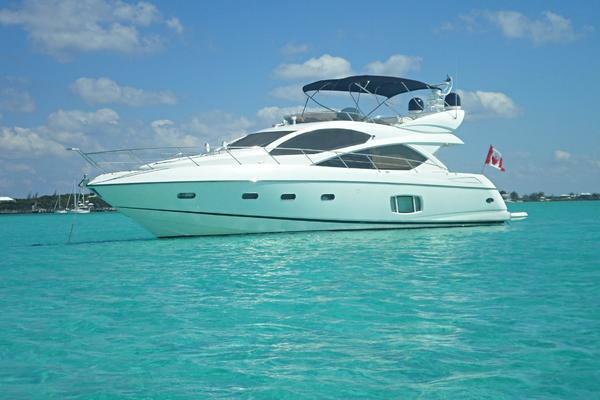 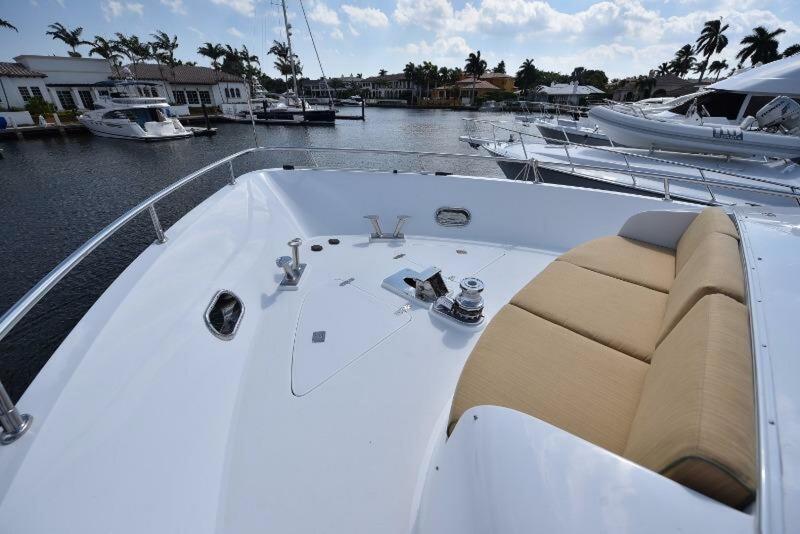 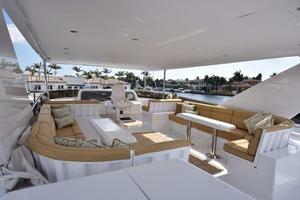 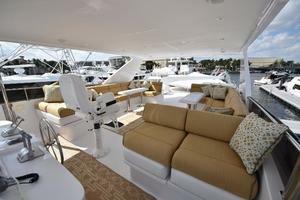 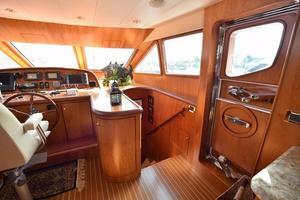 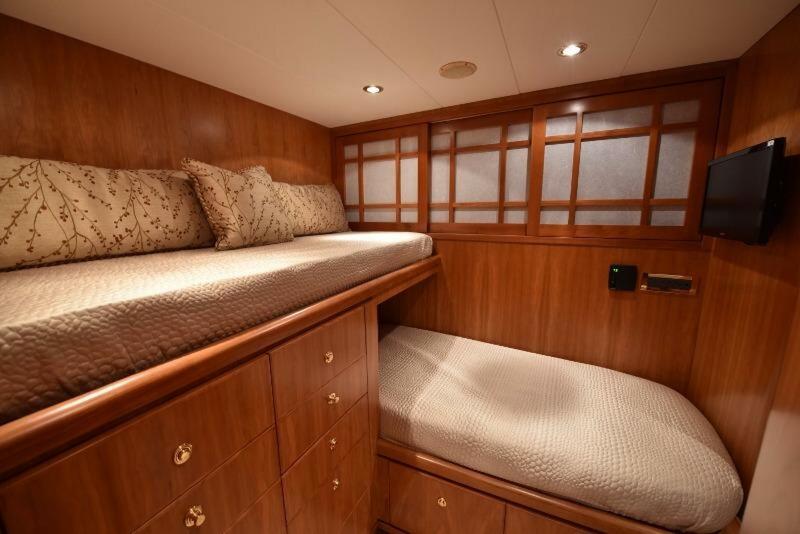 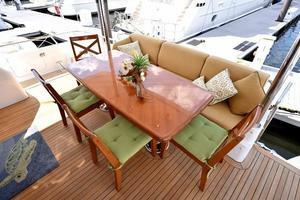 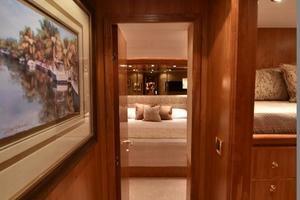 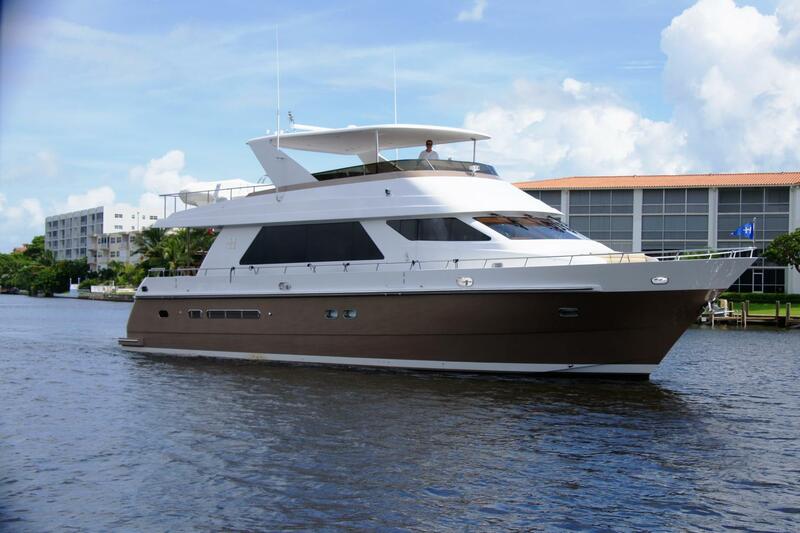 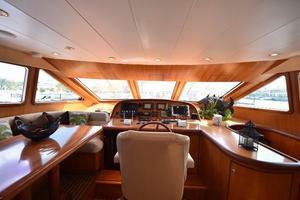 Thoughtfully placed where this yacht is widest, the master stateroom is quite roomy. 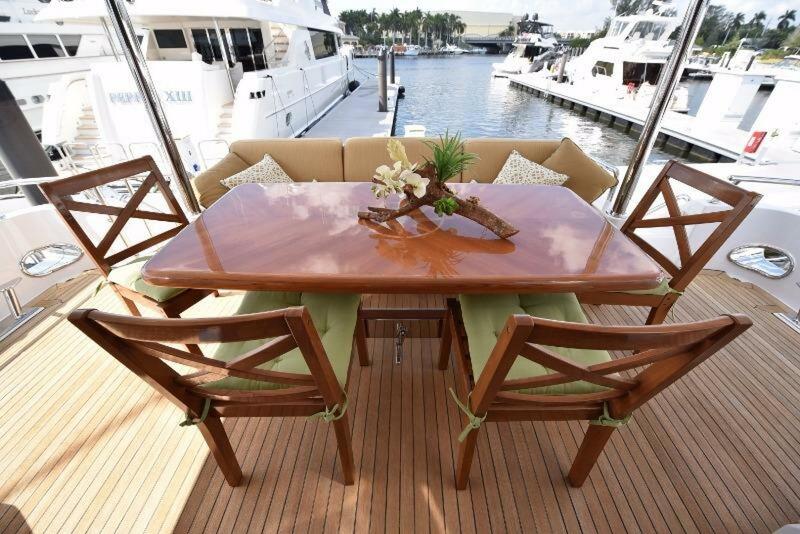 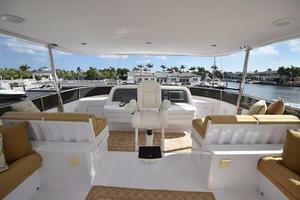 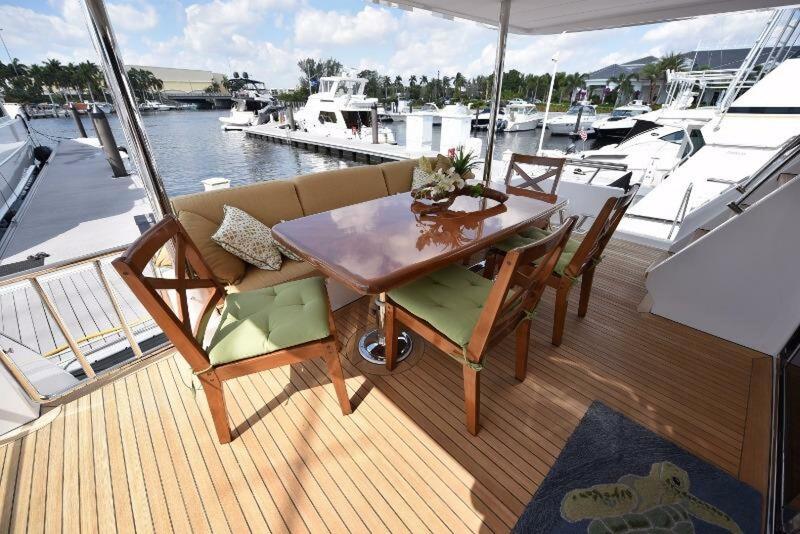 Centrally located, the king berth with its custom Nautilus adjustable air mattress draws your attention with a large mirrored backdrop, fine wood joinery and custom column details. The berth is fitted with sumptuous bedding and a padded headboard. 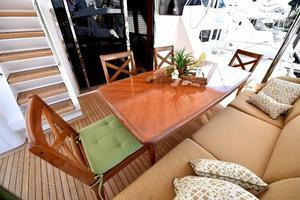 Accent pillows brighten the understated fabrics. Majilite upholstered walls soften the space. 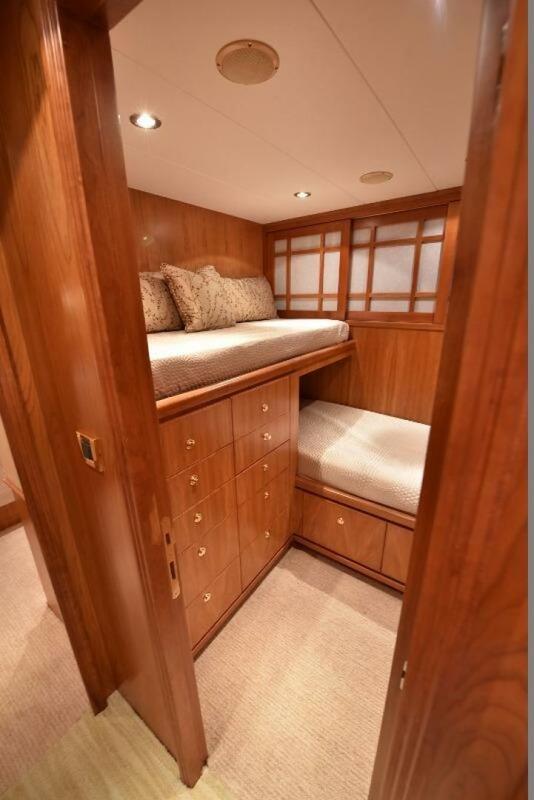 Storage is found to port with a large cedar lined closet, several drawers and display counters set beneath porthole windows. 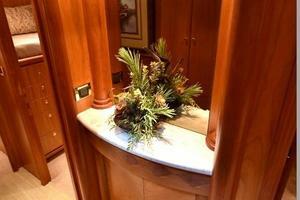 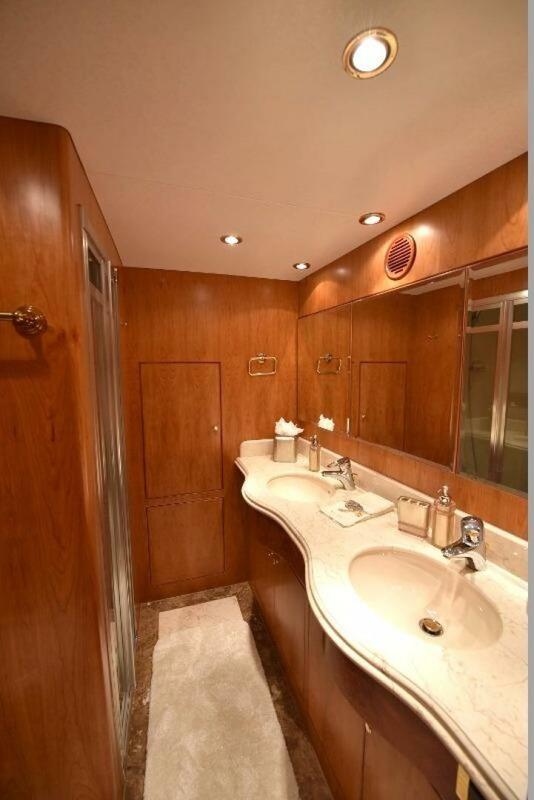 To starboard, a vanity adds a luxurious element to this nicely appointed stateroom. 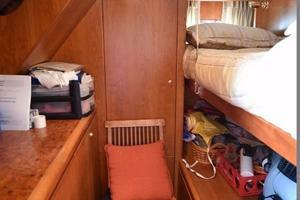 An additional closet is found to starboard. You will also enjoy such entertainment features as a 17" Samsung LCD display television, and a Sony 5-disc /CD player. 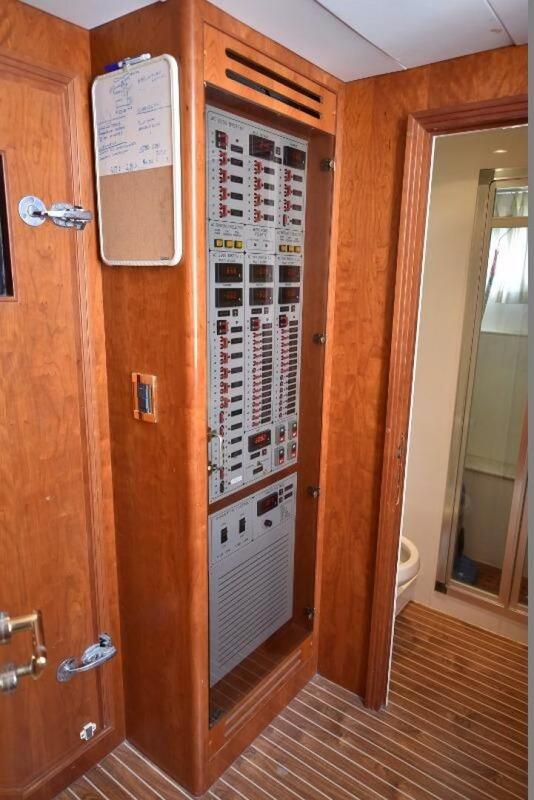 An en suite head is forward and to starboard. 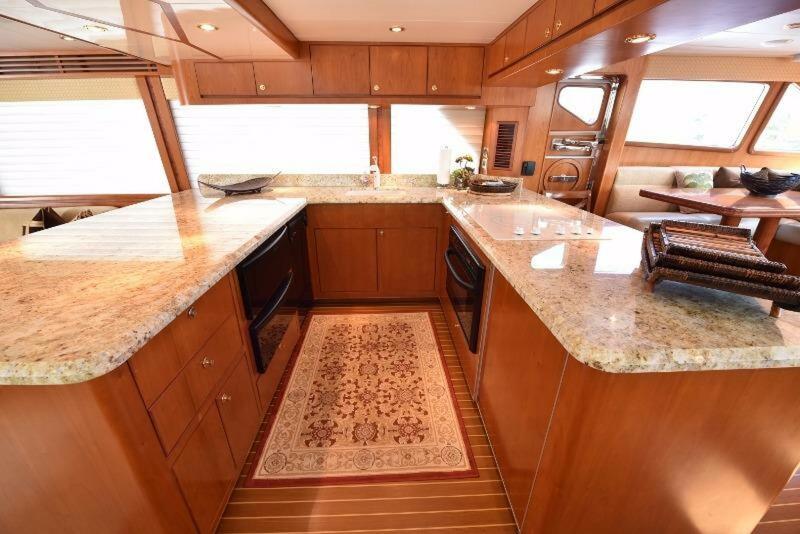 Gorgeous granite floors and counters appeal to the senses, while your practical side will enjoy his and her sinks, a full shower and plenty of storage. 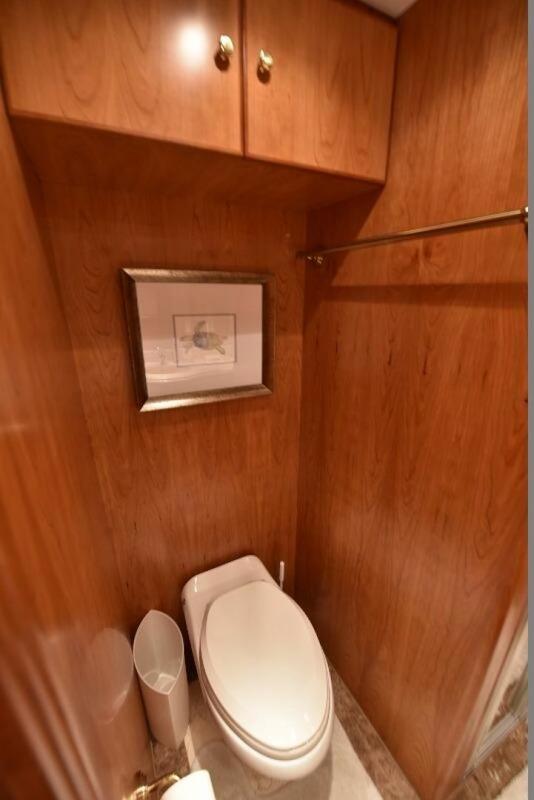 You will appreciate such thoughtful touches as storage cabinets and a towel bar above the head. 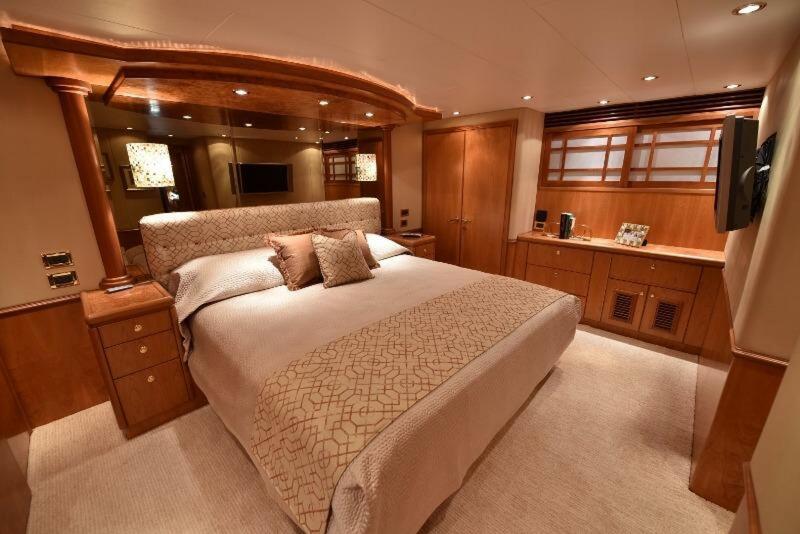 This master suite is an ideal place to escape and relax after the day's adventures. 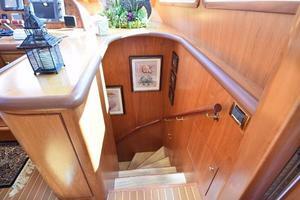 All the way forward down the companionway is the stateroom. The unique angles of this bow stateroom offer an appealing arrangement, which puts the queen berth at center stage. This impressive queen bed with a custom memory foam mattress is detailed with elegant bedding, and a padded headboard. Your guests will enjoy the luxuriousness of this space. 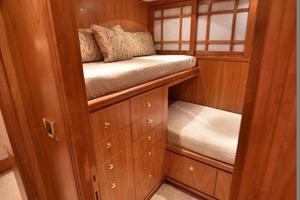 Hanging closets to port and starboard are ideal for weekend trips and extended stays. 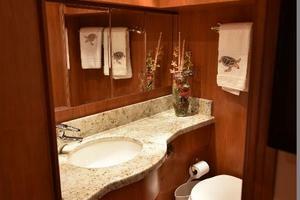 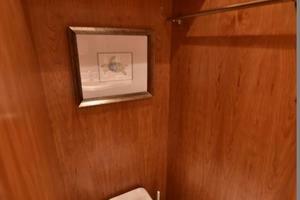 This stateroom also features an en suite head with fine granite counters and a full shower with a granite shower seat. 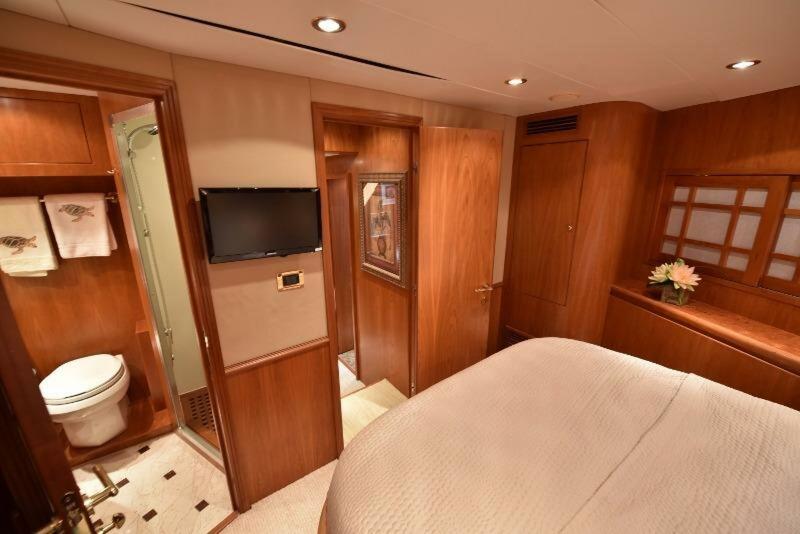 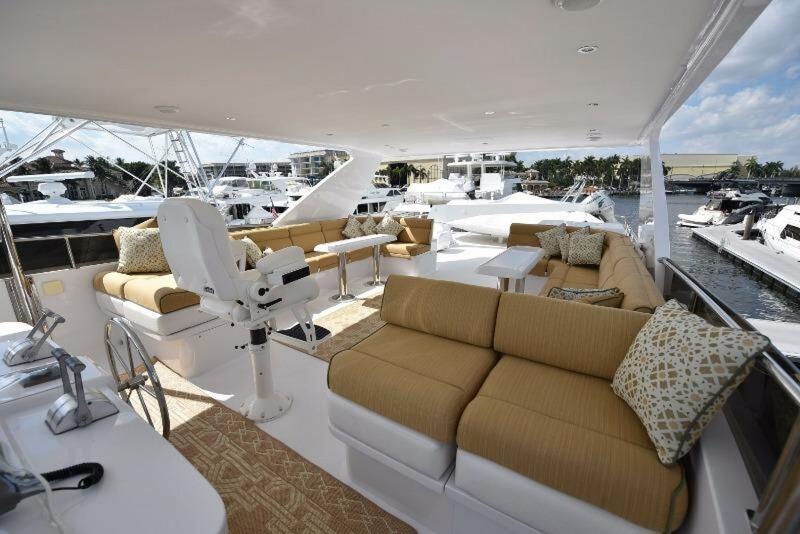 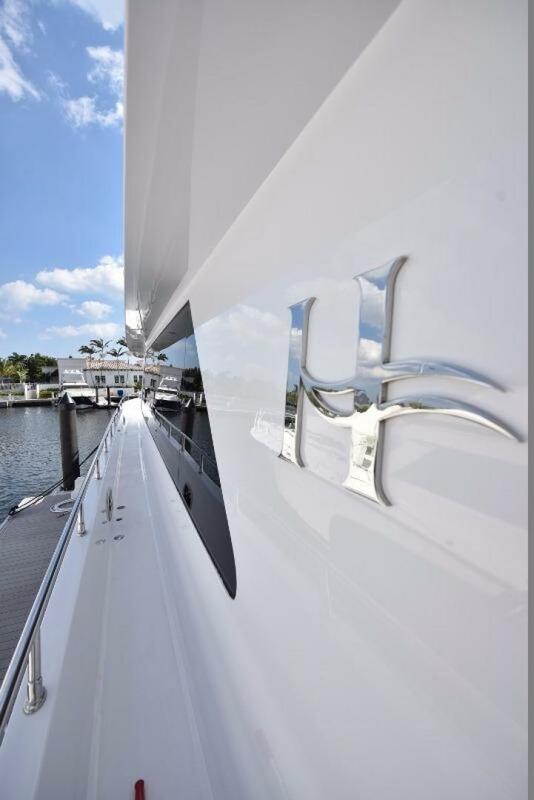 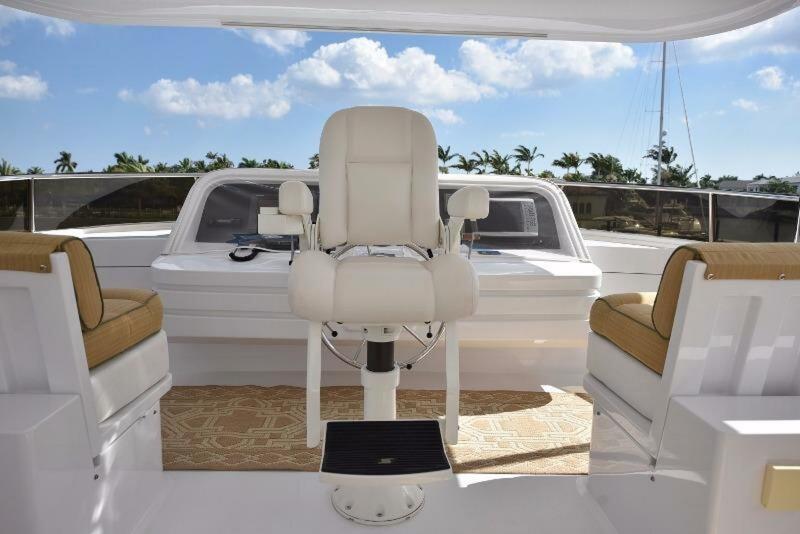 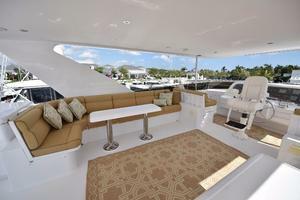 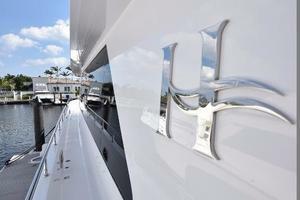 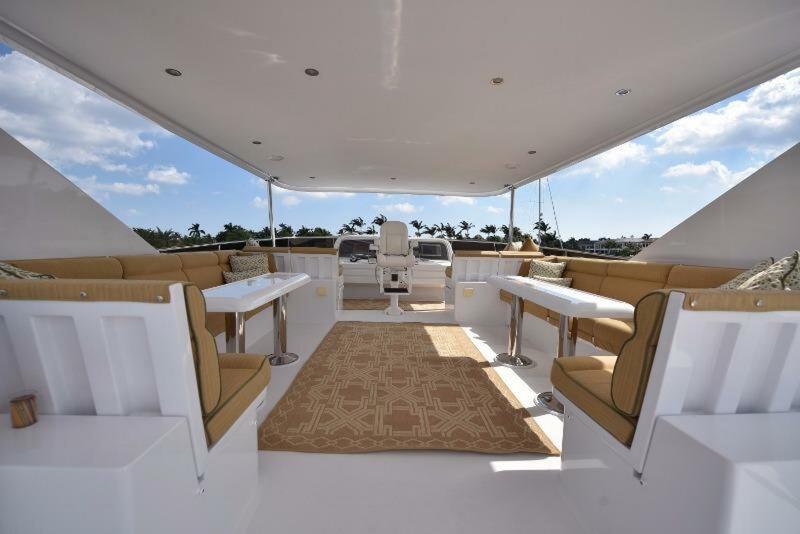 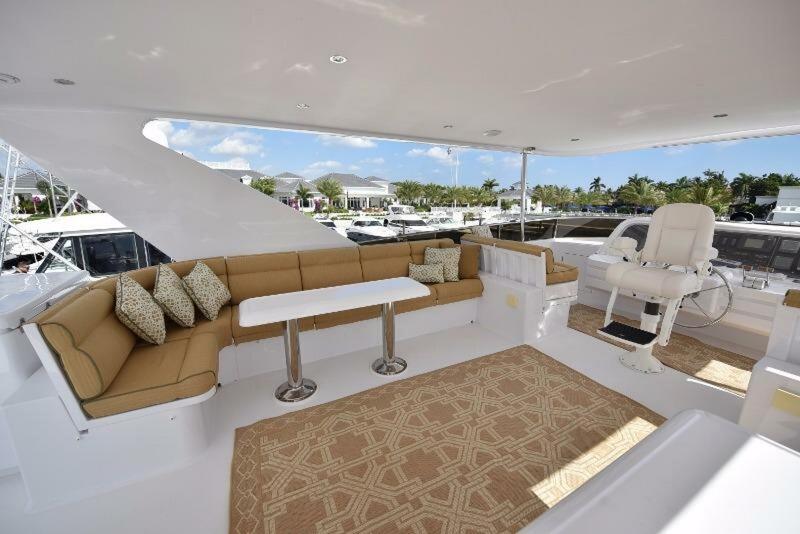 Special custom touches such as lacquered shower walls in each head on this yacht add to the high level of sophistication, which you and your guests will truly appreciate. 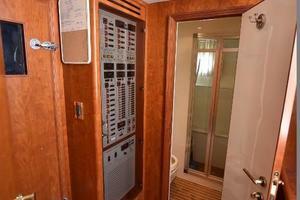 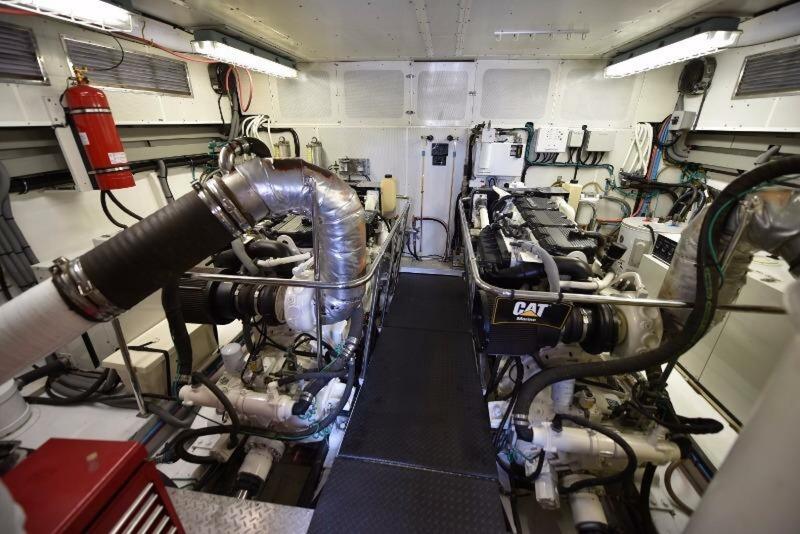 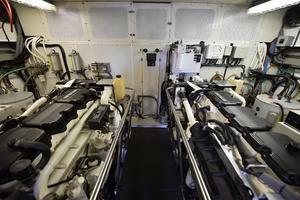 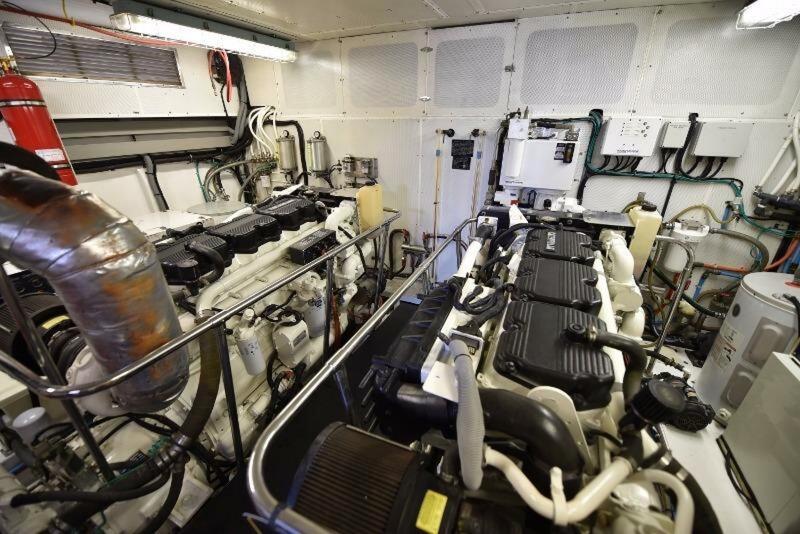 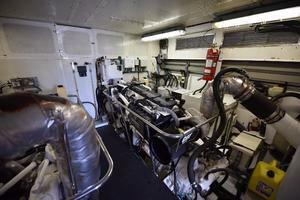 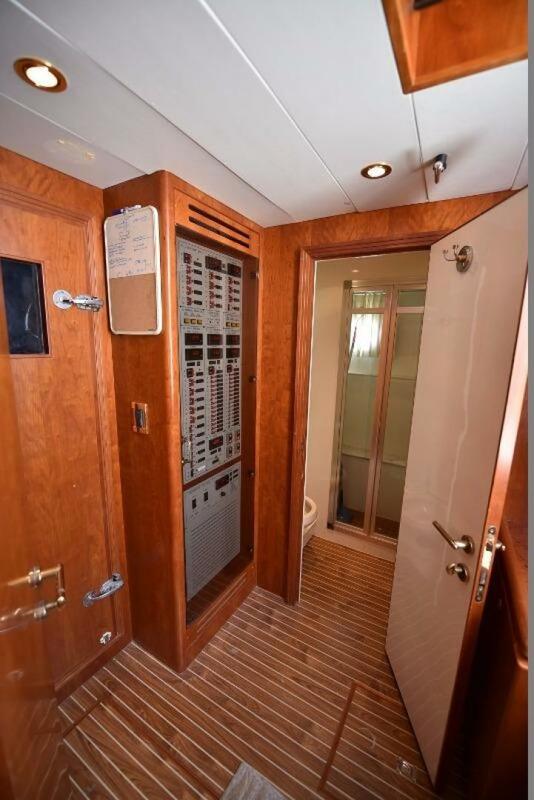 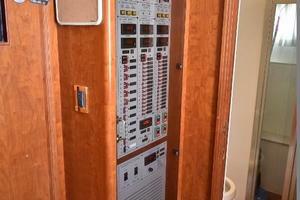 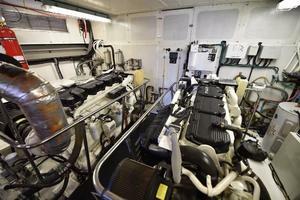 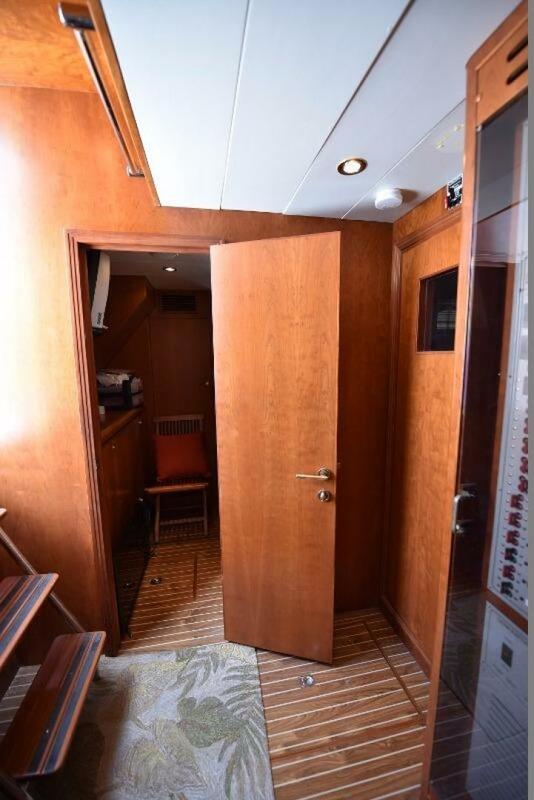 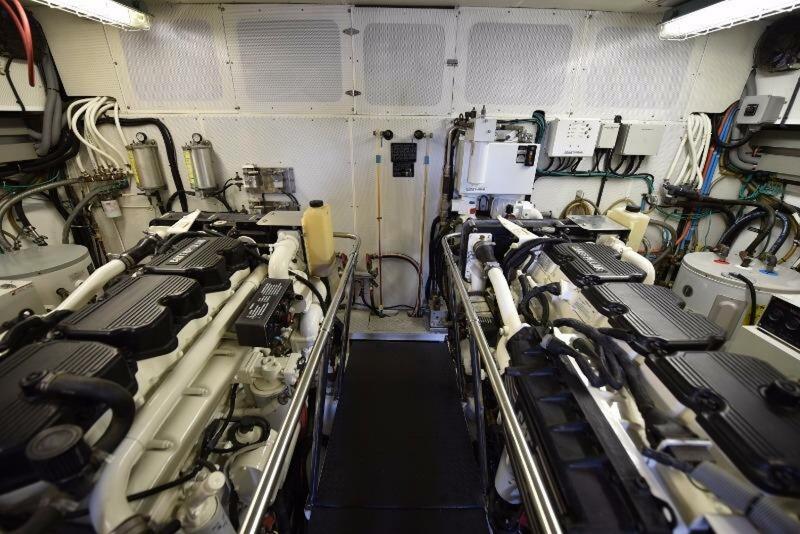 The crew quarters are located aft of the engine room. 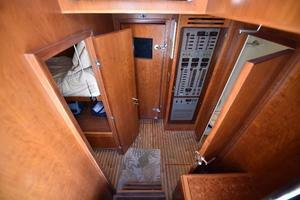 Two crew members will be comfortable in a small suite with over/under bunks and a 13" Panasonic TV/VCR. 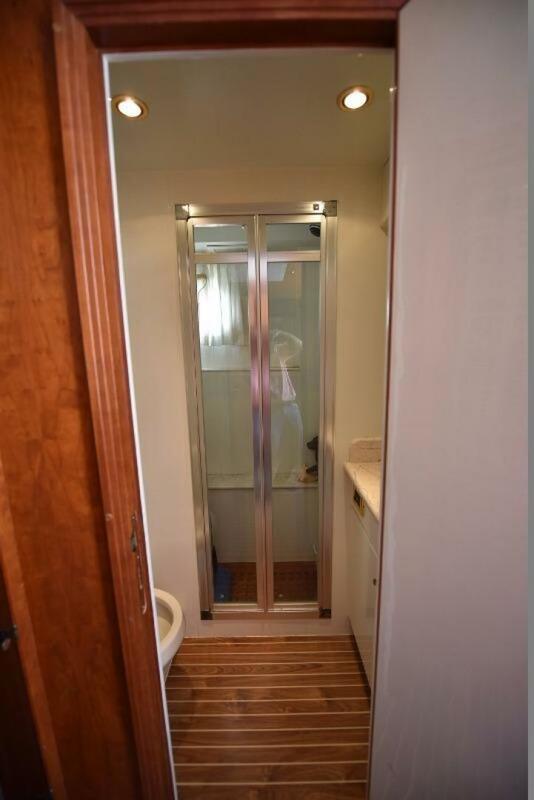 Across the hall is a full head with a stall shower. 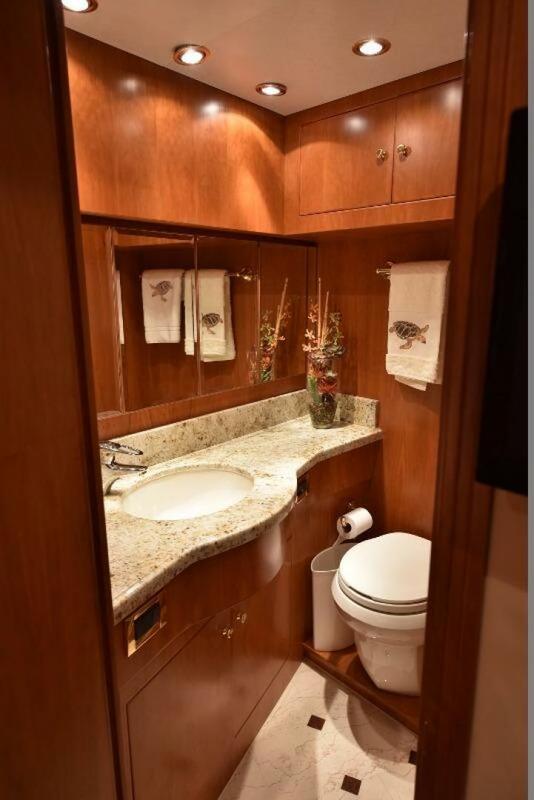 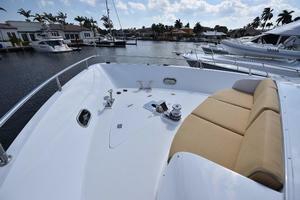 This ideal arrangement gives you and your crew the privacy you need.